This luscious and creamy Scallop Bisque is simple enough for a decadent weeknight dinner, yet luxurious enough to serve to guests on special occasions. January is a month of balancing two basic food groups: healthy salads and not so healthy but oh so delicious soups. We balance this because we just can’t eat crisp, cool salads all winter long. The chilly, blizzard producing New England weather makes our body crave those steaming bowls of soups, stews, and bisques. So after sharing a recipe for a hearty sorghum salad, it’s time to warm up with a mug of creamy, decadent Scallop Bisque. After living on Cape Cod for the past three years, I’ve fallen in love with scallops. Their delicate, sweet flavor and light texture make them the perfect addition to any menu item. 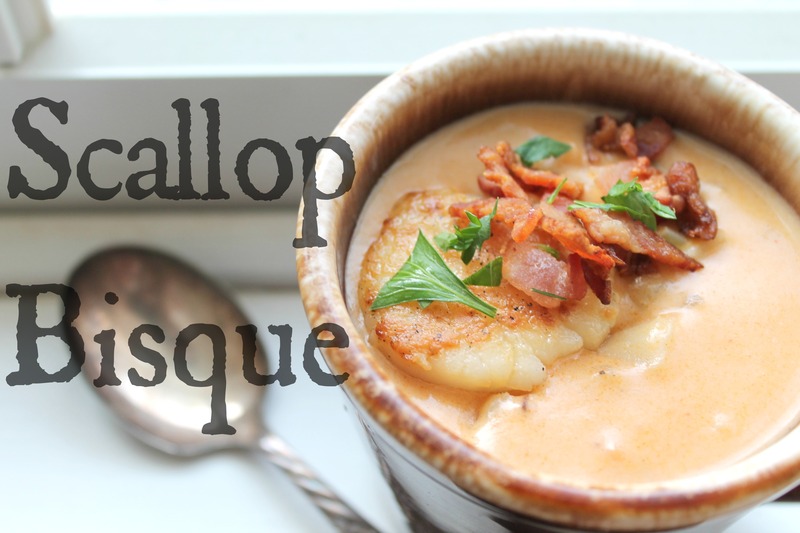 We received scallops from our favorite online seafood company, Anderson Seafoods, and this bisque became reality! These particular scallops are wild and natural, not treated with any chemicals at all. Harvested directly from the ocean, shucked right on deck, and then immediately frozen so they retain their freshness, these are a great item to have in the freezer for quick dinners. This bisque is simple to make but packed with great flavors! You start off by crisping up some bacon and then sautéing the classic mirepoix (25% carrots, 25% celery, 50% onion), adding stock, half and half, and some great seasonings, plus seared scallops. It’s a creamy, luscious soup that works for a weeknight meal served with a salad, or as a first course at a fancy dinner party. If you’re wondering, what makes a bisque, a bisque? There’s lots of confusion everywhere – blogs, menus, recipes all over the internet. From what I’ve learned in culinary school and some research, a bisque HAS to have some sort of seafood in it: lobster, crab, scallop, shrimp. These all make amazing bisques. But I’ve been seeing a lot of recipes for “tomato bisque” and don’t see any seafood in the ingredients list. So make sure you call a soup by it’s name and a bisque by it’s own name! 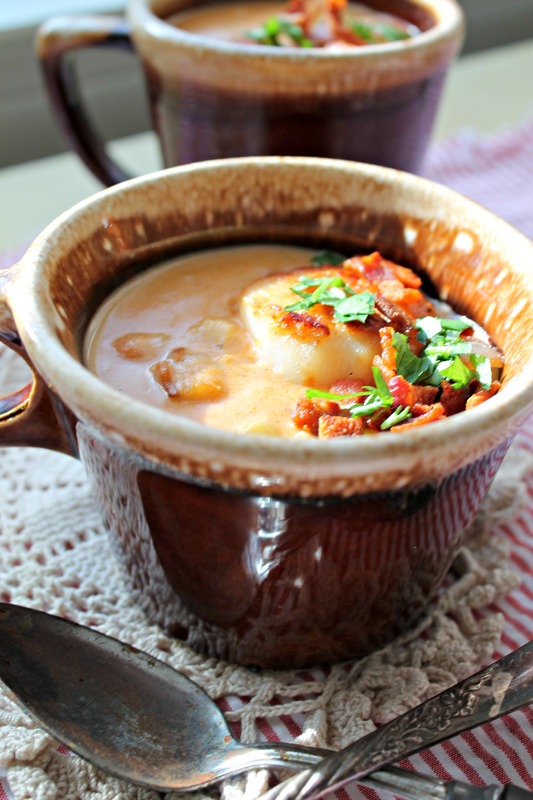 Rich and creamy Scallop Bisque packed with classic mirepoix, bacon, and fresh herbs. In a medium stock pot over medium high heat, cook the bacon until crisp. Remove bacon but leave the fat in the pot. Sear scallops on both sides in the bacon fat, remove from pan, and reserve. Lower heat to medium and sauté celery, carrots, and onion until translucent (about 10 minutes). Stir in tomato paste. Add butter and flour to make a light roux with the vegetables, and cook for another 5 minutes. Slowly add the fish stock, whisking until incorporated. Lower heat to medium low and add half-and-half, wine, Tabasco, and seasonings. Taste the bisque and season with salt to taste. Simmer for 10 minutes and add the reserve chopped crispy bacon. While simmering, chop scallops. Add scallops to simmering bisque and check seasoning. Serve topped with scallops, fresh parsley, and crispy bacon. Note: If you don't have fish stock, you can easily substitute with chicken or beef stock, although the seafood flavor won't be as prevalent. It's still delicious! Way too much Tabasco for me. I Should have used a teaspoon not a tablespoon. Wife couldn’t even finish. It gave me the sweats! This will be happening in my kitchen SOON! I can’t think of enough ways to consume scallops!!! Oh, Nelly, made this today and it’s amazing! Only change was that I wanted to use a bag of small scallops I had in the freezer so I made the base and then tossed those in to cook at the last minute. The base itself was worth eating alone! Great recipe. Oh, I need to make this! looks so good! This looks glorious! So warm and cozy, I can’t resist! So making this, looks and sounds amazing! Thanks for the “Bisque” tutorial! This recipe makes me miss seafood, the cape, and you too! I love scallops… this sounds divine and so warming! I’m making this. 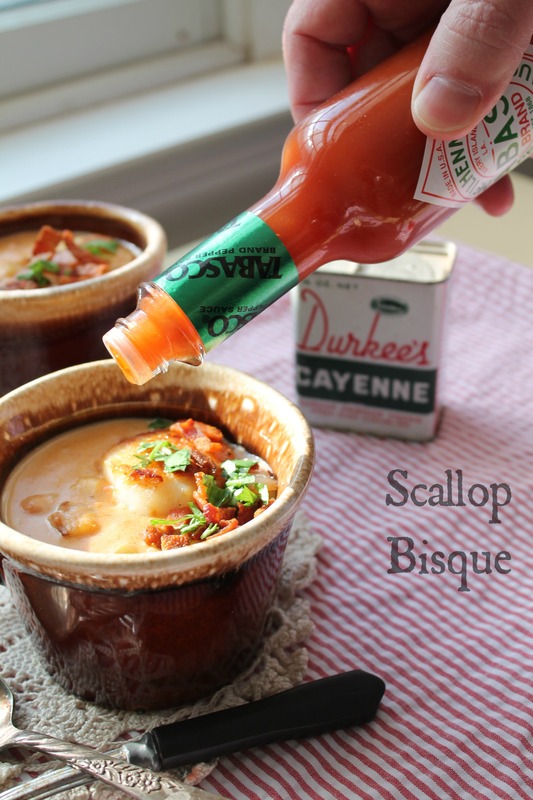 Lobster bisque is one of my faves and I’ve never had it with scallops! Scallops? Bacon? Cream? I am from New England you know. Looks amazing, I can’t wait to make this! Seriously, how have I never had scallop bisue? This needs to happen. This looks delicious! Roy is always making fun of the way I pronouce “scallop” (aaaaa) which is decidly not the Massachusetts way!